A Coalition plot fools a number of innocent people into undergoing Juicer augmentation. 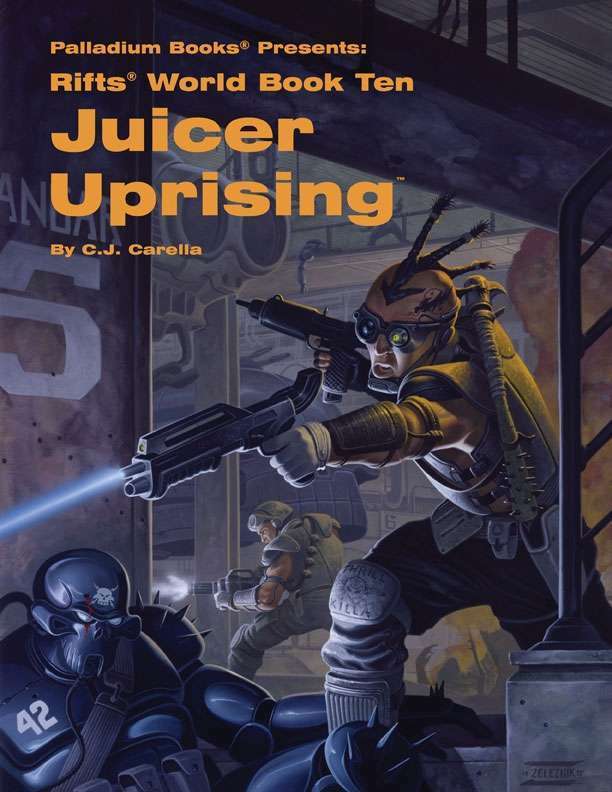 When the lies are revealed, a Juicer army rises up to lay siege to the CS city of Newtown. Chaos erupts as Juicers, bandits and outlaws ravage the countryside. Action-packed adventure and source material. 15 new types of Juicer O.C.C.s including the Hyperion Juicer, Titan Juicer, Coalition Juicer and rare Coalition Psycho-Stalker. Techno-Wizard Juicers like the Dragon Juicer and Murder-Wraith. The Juicer O.C.C. developed and expanded; the motivations behind these suicidal warriors, and the process and effects of being “juiced” completely described. New Juicer weapons and vehicles designed for speed and reflexes. Prometheus Treatment: Juicer immortality or a Coalition lie? Newtown, Fort El Dorado, and world information. Juicer sports like Deadball and the Murderthon. Juicer organizations including the Juicer Army of Liberation. Written by C.J. Carella with Kevin Siembieda.